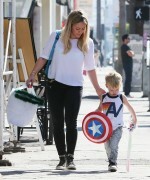 Hilary Duff Spotted Out With Her Halloween Loving Son In LA! It seems like the Duff family just cna’t get enough of the fun Halloween season this year! Yesterday we reported that Hilary Duff and her son Luca attended a Halloween party recently when Luca dressed up as Jake from ‘Jake and the Neverland Pirates.’ On October 24th Luca showed his Halloween spirirt again as he and Hilary were out and about running errands in LA. We’re happy to report that Los Angeles, CA is in good hands with Luca dressed as Captain America complete with an awesome shield! 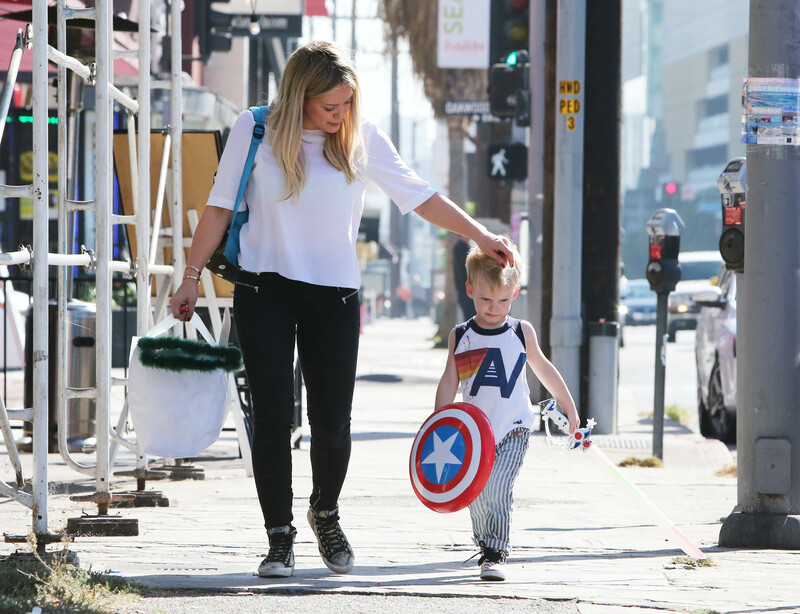 Hilary Duff Spotted Out And About With Her Son Luca In Hollywood – Pics Here! Hilary Duff was spotted out and about in Hollywood, California yesterday with her adorable son Luca. The mother and son pair ran errands around town and avoided the LA heat as best the could.